Mountain Lakes High School is renowned for its top-notch athletic programs. While the number of sports represented has grown over the years, there is one athletic discipline that still does not have a presence: gymnastics. While this may present a roadblock for some, it did not stop Anne Woynerowski Meade from pursuing her passion. 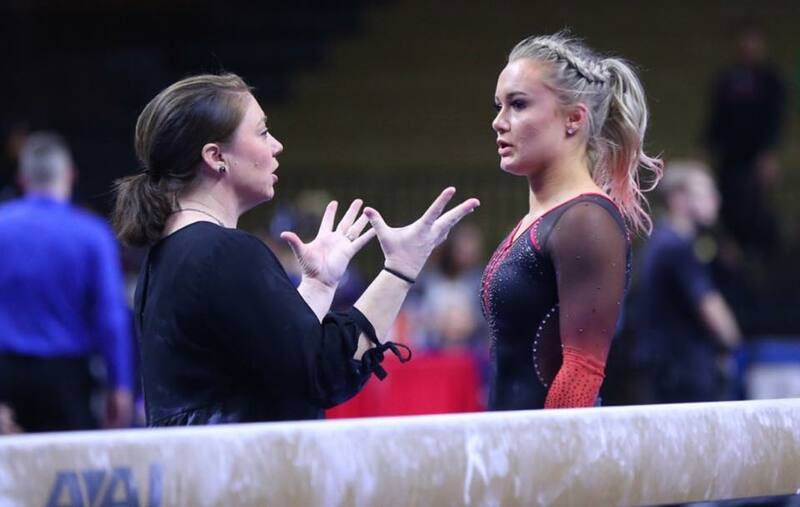 An MLHS graduate from the Class of 1995, Meade has achieved immense success in gymnastics on some of the highest levels. From an early age, she dedicated countless hours in the gym, beginning her journey at North Stars Gymnastics Academy where she competed with numerous talented gymnasts. At the age of 14, she was the Junior National Champion, earning the Gold medal at the Pan American Games in Havana, Cuba. In addition to participating in other national competitions, she earned a full scholarship to the University of New Hampshire and continued her gymnastics career there. Since graduating in 1999, she has coached at all levels, spanning from preschool children to elite college athletes. 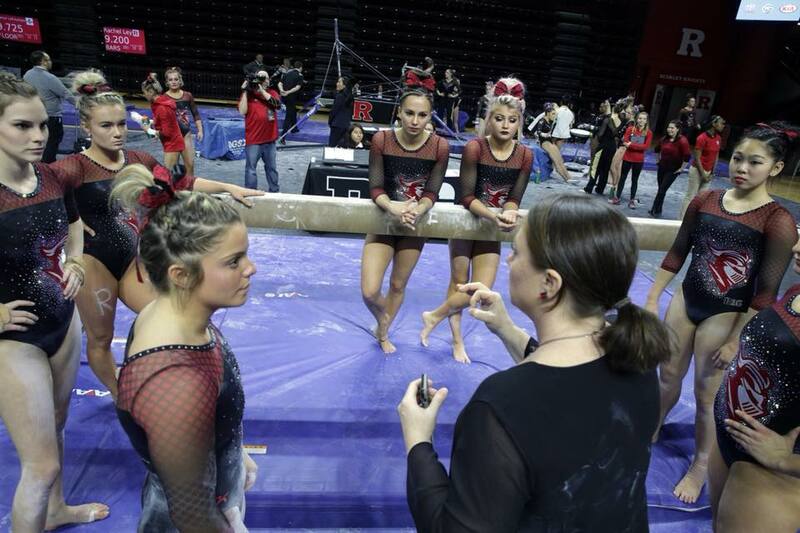 Coming off her recent tenure as interim head coach for the Women’s Gymnastics team at Rutgers University, she made time to give us insight on her experience in town, her current pursuits, and what is next in her accomplished career. AM: We moved to Mountain Lakes from Omaha, Nebraska in 1984. MLAA: How would you describe your time in town? AM: I have always loved Mountain Lakes and the people I grew up with but I did not spend much time in town. I spent about 35 hours a week training in gymnastics. MLAA: What clubs/sports/activities were you involved with during high school? AM: As far as clubs and sports in high school, I did not have much time for outside sports! I was, however, on the Varsity Cheerleading Team my junior year and captain my senior year I believe. MLAA: When and how did you get involved in gymnastics? AM: The story goes that at two years old, my mom found me hanging upside down by my knees from the kitchen counter. I was very active and strong; climbing, flipping and jumping everywhere. My mom put me into gymnastics for my safety and for her sanity! Fast forward to the age of five and a half when I began my journey at North Stars Gymnastics Academy. I trained along some of the most talented, dedicated and determined people I know still to this day. By the age of 11, I was on the US Junior National Team and competing in national competitions such as The USA Championships and representing our country internationally at the Junior Pacific Alliance. At 14, I became Junior National Champion and competed in Havana, Cuba at the Pan American Games where we took home the team Gold. 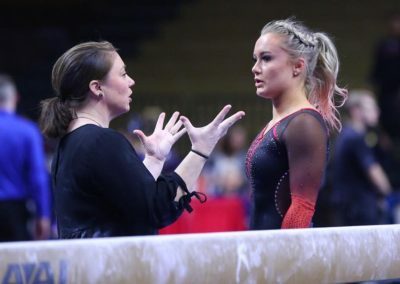 MLAA: What has been the most rewarding part of being involved in gymnastics? AM: Watching the athletes I work with become strong, independent and successful adults. MLAA: Prior to coaching at Rutgers, what was your athletic and career background? AM: In 1995, I graduated Mountain Lakes High School and received a full athletic scholarship to the University of New Hampshire. In 1999, I graduated with a degree in Early Childhood Development. By June of 1999, I began working at North Stars Gymnastics Academy, now as a coach. I coached everything from preschoolers all the way up to the elite level. In the summer of 2016, I took my passion to the next level. I joined the University of Pittsburgh Women’s Gymnastics staff in the NCAA as an Assistant Coach. The very next summer, I became an Assistant Coach for Rutgers University. 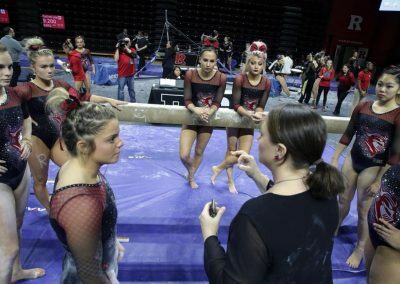 It has been a dream of mine to build my home state university into the gymnastics powerhouse it is capable of becoming in the Big 10 and nationally. MLAA: How was the feeling of being inducted into the New Jersey Gymnastics Hall of Fame in 2017? AM: Hall of Fame…Truly an honor to be given this title for something that I am so passionate about doing. MLAA: In your view, what was the best moment of your gymnastics career? AM: If I had to name one favorite moment in my career I would have to say it was pretty surreal to stand on the first place podium with my fellow U.S. teammates and hear our National Anthem being played, in Cuba of all places. MLAA: Anything else we should know about you, your family, or career? AM: My life has always been very goal oriented and driven by a passion to be the best I can be. My parents instilled that into all of their children. They were unbelievable role models for us. I was fortunate to have a coach/boss that was the same way. Gymnastics came very easily to me. I loved it and I still do as much to this day. It is a huge part of my life that has taught me so many valuable lessons—how to succeed, how to fail, to set attainable goals—but to never underestimate my ability. I control my fate and only I can limit myself. MLAA: What advice can you offer to the readers on how to be successful? AM: You can’t finish your day if you don’t get it started. Get up every day with a purpose and a goal. Enjoy the process of your journey without succumbing to the pressure of the result. Love what you do and do what you love. Don’t be afraid to make mistakes. MLAA: What is next for Anne Meade? AM: To continue setting goals and working hard at obtaining them. AM: I love most music but I don’t know if I have a favorite. I do enjoy classic rock, country, and the 80s, of course! Favorite movies are Sixteen Candles, Top Gun, and any Christmas movie! MLAA: If you could invite three people to dinner, alive or dead, real or fictional, who would they be? AM: My mom and dad–my heroes. They have made more of an impact on me and my life than anyone else ever could. John Wooden–a legend; not just an amazing coach and leader, but a great person in life.